Unpublish the post: this allows you to hide the post from the public, but retain its content. This can be helpful, for example, if you plan to reuse that post in the future. Delete the post: this will permanently remove the post from your system. 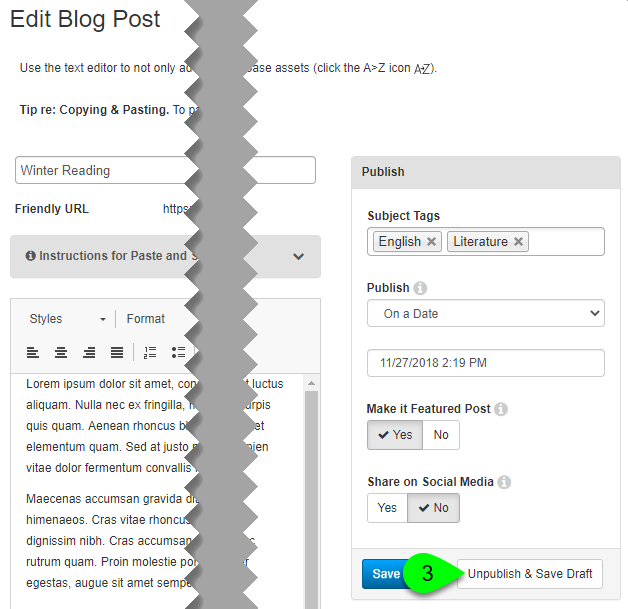 On the Edit Blog Post page, click on the Unpublish & Save Draft button. The Delete Confirmation window will appear. To proceed, select the checkbox next to I understand that this cannot be undone. Click the Delete it - I mean it! button to permanently delete the post. Deleting a post is permanent and cannot be undone. Once deleted, the post will also be removed from your blog's archives, widgets, and RSS feed. Any comments left on your post will also be deleted. This will not delete any Databases or Book from the Catalog assets from your Assets library. Similarly, this will also not delete any images from your Image Manager library.